Halifax’s fast rising The Orielles have announced details of a run of headline shows in November of this year. The band also have a hectic summer planned with a number of festival slots including appearances at Green Man, Sea Change, Port Eliot and Truck. The band, made up of sisters Sidonie B and Esmé Dee Hand Halford and their best friend Henry Carlyle Wade, still aged only 21, 18 & 17 respectively, released their debut single Sugar Tastes Like Salt earlier this year on Heavenly Recordings to much acclaim. The eight-minute plus burst of spatial-funk that in part recalled both ESG and fellow north-west pioneers A Certain Ratio, was produced by Marta Salogni, one of the most exciting young producers in the UK right now. Ut, the legendary No Wave band announce a one-off performance in London at The Lexington on Tuesday, November 7, to celebrate the first release of their remastered back catalogue. The Ut EP and Confidential 12 ” vinyl and CD will be released on November 10 by Out Records with Forte Distribution. Forming in Leeds in early 2013, Autobahn blew audiences across the North away with one of the most intense and visceral live shows in recent years. Encapsulating the landscape of their Yorkshire home, their sound soars from the harsh post-industrial concrete of the city right through to the endless Pennine expanses on its periphery. Following the release of two self-titled EPs, AUTOBAHN released their debut album, Dissemble, on August 2015 via Tough Love (recorded with Matt Peel). The band built their own studio in Leeds to record their second album ‘The Moral Crossing’ which will be released on November 3rd. 2017. 1947 in Frankfurt born Wolfgang Flür is best known as the electro drummer of German electronic band Kraftwerk between 1973 and 1986 • Flür developed with his musical partner Florian Schneider the world first electric drum-pads-board for the Electric Quartet • Since 1993 Flür is the founder of Yamo. The album “Time Pie“ (EMI Electrola) was released in 1976 in co-production with Andi Toma of Mouse on Mars • Flür’s next release, a 12“ with remixes of “I Was A Robot“ (Holon), climbed to number 6 in the German Club Charts • “I Was A Robot“ is Flür’s sung autobiography and was especially produced as giveaway of the German book in a parallel edition • The English edition was first published in 2000 called “I Was a Robot“ (Sanctuary), describing his view on the inner workings of Kraftwerk • The book was subsequently released in six different territories / translations and was in the Top Ten of best selling music books in 2004 (The Independent) and 2010 in the ten best music histoires (The Observer) • Flür also released a weird short story book on the Germans of the Rhineland Area in 2011 entitled “neben mir“ (next to me) • Wolfgang undertakes book readings in Germany and (very selected) in England) • Since 2004 Flür has been DJ’ing world-wide in clubs and on festivals, playing tech house, industry and electro specialities of his own, of Kraftwerk and of international artists who he’s friendly with • Flür has collaborated with Bon Harris’ (Nitzer Ebb) Shadow Bureau project and lent his lyrics and voice for the track “Axis of Envy“ • Flür also collaborated with Anni Hogan (former Marc Almond pianist) for the track “Golden Light“ (lyrics and vocals) as well as on “Fashion Machine“ (lyrics and voice) with Ramón Amezcua of Bostich / Mexico • Wolfgang Flür’s current stage performances show videos and rare images from his Kraftwerk past shot to his present projects added with selected electro tunes for dancing • Musik Soldat (music soldier) is the title of Flür’s program • Wolfgang sees himself as a music presenter with historical electric background. “Uproariously inventive music” Clash Magazine. Alt Pop music from former 6 Day Riot frontwoman Tamara Schlesinger. Hailing from Taiwan, Joanna weaves bits of old fairy tales and Americana with pop and video game soundtrack influences into whimsical and irreverent tunes. Koen Van De Wardt records ethereal, oft-hushed but forever gripping synth-anchored music under the moniker Klangstof that’s a collage of supremely genteel yet haunting vocals, sleek melodies and experimental beats and rhythms. HAWK combine an abrasive edge with celestial vocals, to create a driving, expansive sound, with activism at its core. HAWK have been compared to Warpaint and The Cranberries with hints of Slow Dive and Radiohead. Their music covers subjects like inequality, exclusion, gender-preconceptions and generalisations faced by different social groups every day. Their acute social awareness is a trait that the band hold dear conveying their message with beauty and grace, with triggering, dreamlike soundscapes to mirror the inequalities they witness in everyday life. HAWK formed in London in 2014, where they formed their label, Veta Records. The band relocated to Berlin in 2016 where they are still friends after a winter living under one roof. Amongst the band’s supporters are Noisey, Stereogum, Clash, The Line of Best Fit and Amazing Radio, who have all commented on HAWK’s dynamic sound and compelling subject matters. Signing his record deal with XMR on William Blake’s grave, it’s fair to say Saint Leonard’s Horses is an enigma. Having played with the likes of Billy Bragg, Beck, Bob Dylan, Father John Misty and Ryan Adams, he’s also recorded his debut album Good Luck Everybody within Stanley Kubrick’s estate, having written songs inspired by retreats into the Mojave Desert, a cabin in Nashville and a gothic church on the Yorkshire moors. Leonard himself has plenty of experiences to relay to everybody, as he invites them into his world whether at cinematic live shows or through the aural jigsaw of his album. Mammoth Penguins bring their new album “John Doe” to London, which tells the story of the people who were close to a man who has faked his own death, only to return years later. For the last 2 and a half years Sleep Party People has been touring all over Europe and Asia in support of their last album. 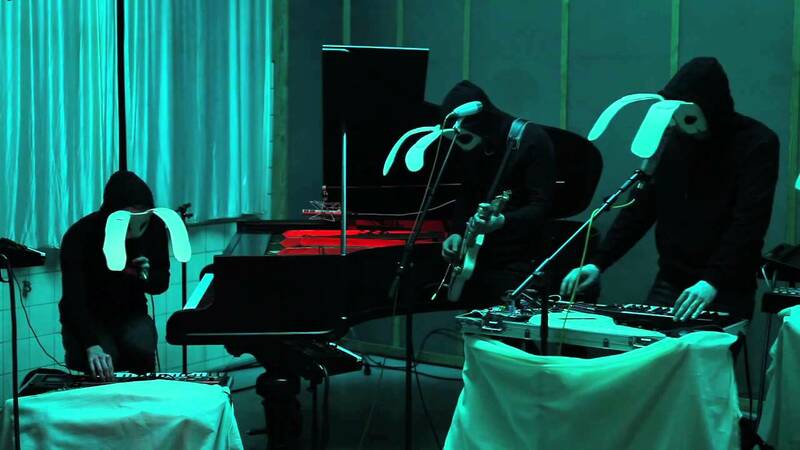 The countless live shows has inspired Sleep Party People to focus on a more organic sound than before including the live band in the recordings. In the summer 2017 Sleep Party People will return with new music. The new album ‘Lingering’ will be out through Joyful Noise Recordings. Releasing albums in 2010, 2012 and 2014 Sleep Party People has gained attention of fans worldwide with 80.000 followers on Facebook. Two different versions of the song “I’m Not Human at All” has reached more than 6 million views combined. Having previously mainly toured in Europe and Asia 2017 marks the year where Sleep Party People will give increased focus to the many fans in USA, Mexico and South America. “As a sonic architect, Batz proves to be something close to a Genius … Wonderful” – The Sunday Times. Taking as inspiration the work of Boards Of Canada, David Lynch and Erik Satie, Batz found the sound of the old battered piano in his apartment, coupled with a freaky electronic alteration of his recorded voice, created an eerie, hypnotic sound often labeled as Dream Pop. Best known as one half of the critically acclaimed Scandinavian pop duo Wildbirds And Peacedrums, Mariam Wallentin has been re-born as Mariam The Believer, an introspective and melancholic creation of forceful pop that characterises Mariam’s vision of hope, of light at the end of a tunnel. Nelson Can started out as a lie – there was no band – it was just a dream. ‘We just really wanted to tell people that we had a band, and so we did. Now we actually have a band and it is just as amazing as we had imagined it would be.’ Nelson Can operate with several dogmas and a very noticeable one is that the band use no guitars. Their sound is original and “to-the-bone” simple, inspired by acts like The White Stripes, Yeah Yeah Yeahs and Siouxsie and the Banshees. The set-up with only drums and bass creates the perfect framework for the simple, yet very powerful melodic dogma rock sound. Like, say, Elliot Smith (rest in peace) and Damien Jurado, Albert is a very brave and straightforward singer- songwriter. His melodies and lyrics are like uncensored and infinitely beautiful letters – without euphemisms and false chords they let you know what’s on his mind. At the same time they’re universal – if you’ve loved and lost you can relate to them. They also start your internal movie projector. With “Ashes” on the stereo and with eyes closed memory fragments, glowing emotions and pure dreams fly through your soul. That Filip’s production (which you’ve heard on Anna von Hausswolff’s two latest albums) is both intimate and grand at the same time makes this personal cinematic experience even more sensational. Hajk’s first song, «Common Sense», was listed by Norwegian radio stations almost before the band got of our their rehearsal space, and the album «Magazine», which was released in early autumn 2017, got a great reception by international media. In the US, «Noisey» picked up the single straight away, and this blazed the trail for the band over there. In England, «Indie Shuffle» was quick off the mark. Sweden also liked Hajk’s consistent pop music, and «Svenska Dagbladet» called «Magazine» one of the best, new songs that autumn. The bands debut album has gotten great reviews in Scandinavia, Germany, UK, US and beyond. The band are influenced by artists like Dirty Projectors, Unknown Mortal Orchestra and Amason, but still they stand firmly on their own feet, with an original sound that also challenges the genre they belong to.